WANTED: 100 civic-minded individuals who are up for a challenge and want to raise money for a great cause. The challenge, should you accept it, is to raise $5000 for the St George & Sutherland Medical Research Foundation (SSMRF), and walk 100km from Wollongong to Sutherland Shire – all the while having a whale of a good time. And, if walking is not really your thing you can choose instead to participate in a car rally or paddle from Wollongong to Sutherland Shire. All of these events, which take place over the weekend of 22 and 23 October, are part of the inaugural Michael Tynan Memorial Challenge, which commemorates the life of a very special man as well as the 50th anniversary of the business he founded, Tynan Motors. The goal is to raise $500,000 to further the work of SSMRF, of which Michael Tynan and Tynan Motors have been major supporters since it was founded 10 years ago. 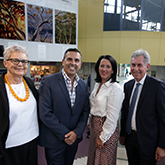 Many prominent institutions, are supporting the event – including the University of Wollongong, St George and Sutherland Leagues Club, the Illawarra Mercury and The Leader, St George Bank, Tradies and Westfield Miranda and Masterton Homes. Footballers from the Cronulla Sharks and St George Illawarra Dragons will be putting together walking teams which the community is invited to sponsor. Head to the event website for more information or contact the team via email info@michaeltynanchallenge.com for more details or to be involved.